This beach is located beneath the Valamar Collection Dubrovnik President Hotel in the attractive setting of Babin Kuk (4 km from Dubrovnik's Old Town). From the beach you can enjoy amazing view of Elaphite islands and open sea. 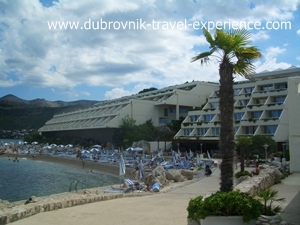 Hotel Dubrovnik President beach is one of the most attractive beaches in Dubrovnik. It is a combination of pebbles, rocks and cement area for sunbathing. The great choice of summer activities is available at the beach (banana boats, water-skiing, canoeing, diving). There is a beach bar where you can refresh yourself. You can also rent deckchairs and parasols. Public showers and changing rooms are available for use. In the near vicinity of the beach you will find several hotels (Hotel Valamar Lacroma Dubrovnik, Hotel Argosy, Hotel Neptun, Hotel Ariston, Royal Palm Hotel and Royal Princess Hotel). FROM PLOCE: Take bus no.5 and ride it to the last stop (close to the Valamar Collection Dubrovnik President Hotel). Cross the road and take the stairs leading down to Hotel Neptun. Turn right and walk straight for about 3 minutes. FROM OLD TOWN: From Pile gate take buses no.5 or no.6 and get off at the last stop. After reaching Hotel Neptun turn right and walk for about 3 minutes. FROM MONTOVJERNA: Take bus no.5 and get off the bus at the last stop. FROM GRUZ: Take bus no.7 and ride it until the last stop. Find the stairs leading to Hotel Neptun, turn right and walk for about 3 minutes until you reach the beach. FROM BABIN KUK: Walk across the Babin Kuk park to the bus stop. Cross the road, walk down the stairs, turn right and walk for about 3 minutes.